Disappointingly, there seems to be widely-held perception that the youth of today behave worse than any generation of kids before them. A fair amount of research has been dedicated to showing this generation of kids doesn’t behave any more badly than previous generations, but instead it is public perception that casts them as wild and out of control. In the 1990s, this led to a wide array of policies designed to punish youth to the maximum, including laws that transfer youth to adult court, zero tolerance policies that put police in schools, and an overall reliance on confinement. . 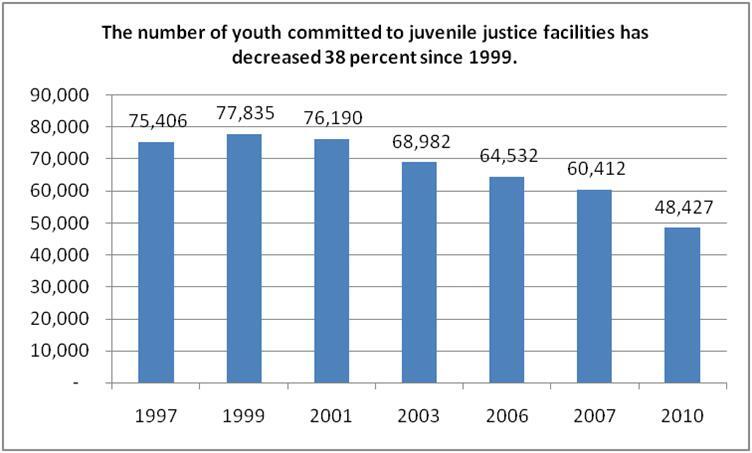 The result was more than 100,000 youth committed to the juvenile justice system in the late 1990s. According to the latest data from 2010, the number of youth in detention or committed to a juvenile facility has decreased 19 percent from 85,280 youth in 2007 to 69,006. The number of youth in detention or committed to a youth facility after a finding of guilt has been slowly decreasing since 1999, a year that reflected a recent high point in the number of youth locked up. 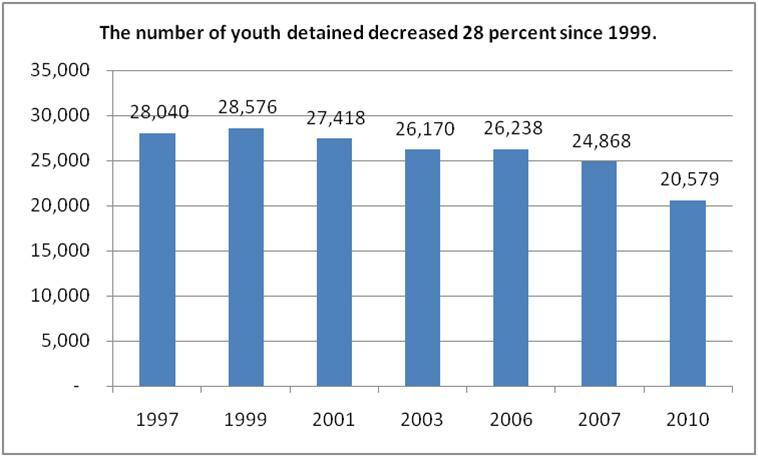 In 1999, there were 106,411 youth in detention or committed to a youth facility. Since, then the number of youth locked up has decreased 35 percent. Separately, the number of youth in detention has fallen 28 percent between 1999 and 2010 and the number of youth committed to a facility has fallen 38 percent. 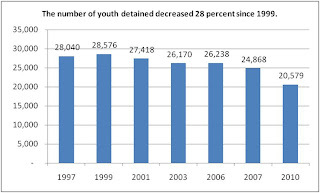 The rate of detention and commitment are down, too, from 257 committed youth per 100,000and 94 detained youth per 100,000 in 2009 to 154 and 65, respectively, in 2010. While it is somewhat difficult to compare detention and confinement statistics beyond what is available on OJJDP’s website, these numbers appear to be lower than they were even in 1975, when 74,270 youth were confined. It’s doubtful that today’s youth behave any worse than kids 15 or even 40 years ago, but it does seem that something is going on to reduce the number of youth detained or committed to the juvenile justice system. Likely, that something has to do with policy shifts, initiatives, and advocacy all designed to reduce reliance on incarceration, promote prevention and intervention, and utilize community-based alternatives. Evidence-based practices: The wide-spread acknowledgement and adoption of evidence-based practices like Multi-Systemic Therapy, particularly after the release of Blueprints for Violence Prevention, have created very tangible alternatives to locking youth up. Since then, Vanderbilt University has created a system by which localities can evaluate their own programs for effectiveness without necessarily investing in other, new evidence-based programs. Fiscal architecture shifts: States like Ohio, Illinois, New York, California, Pennsylvania, Texas, and Wisconsin, to name a few, have created financial incentives (or disincentives) for counties or localities to commit youth to community-based services in their home communities, rather than relying on a state-run facility. These system changes vary in their approaches and are far from perfect, but have all encouraged counties to keep kids out of youth prisons. Re-thinking state commitment: Missouri may be the first place to totally rethink how youth are held accountable and in what types of facilities. The Missouri Model utilizes a system that relies first on a continuum of placements for youth who are committed to the juvenile justice system, including community-based placements. The last resort are facilities that look more like schools than prisons that provide services, treatment, and education. Missouri’s system has seen positive individual youth outcomes and low levels of recidivism. The District of Columbia uses a similar model and Louisiana and New Mexico are also considering the same type of system. Supporting customized best-practices for change: Models for Change and Juvenile Detention Alternatives Initiative (JDAI) have both supported state and local efforts to reform juvenile justice systems. Models for Change supports the production of replicable models of juvenile justice that hold youth accountable and protect public safety, while ensuring the safety of youth who do become involved in the system and improving their life outcomes. JDAI works with counties to reduce the number of youth in detention. Both have helped jurisdictions make significant changes to reduce the number of youth that are locked up. Of course, the work of advocates, organizers, and committed people across the country have helped make many of these policy changes possible, in addition to numerous pieces of legislation, administrative changes, facility closures, and general support for change. But, there is still a long way to go. In 2010, there were 1,365 youth convicted in adult criminal court, which is almost a doubling of the number of youth convicted in adult criminal court in 2007. Racial disparities haven’t changed much either. Even though youth of color make up about one third of the general population, they still make up about two-thirds of the youth involved in the juvenile justice system. And, youth are still confined for status offenses –offenses that wouldn’t be illegal if committed by an adult, like running away, for example. The President is about to release his 2013 budget next week. We all know that 2013 is going to be a tough budget year, but nonetheless, appropriately funding federal initiatives that support the types of initiatives mentioned here that reduce the number of youth committed or detained, help prevent them from getting there in the first place, and protecting them if they do, always goes a long way to saving us money, keeping us safe, and supporting our youth in the long run. Amanda Petteruti is the Associate Director of JPI.